This is where I've documented our unexpected parakeet hatchling's growth. Many pictures can be enlarged (just click on them). Rocky began carving out a small hole in an empty box during her regular outings. 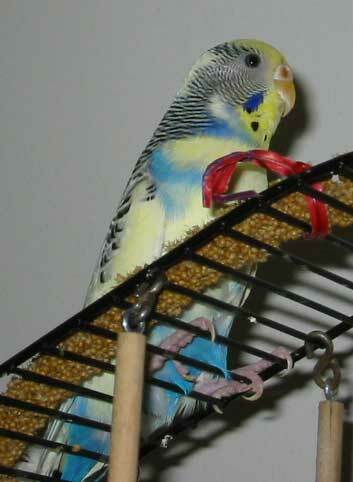 She chews on everything -- typical for a female parakeet -- so this was not surprising. Soon she began spending lots of time deep inside the darkness of the box. I knew she wanted to nest but since there was no male, I thought she was just going through the motions. Although I had 3 parakeets, my vet said all were female. Good, I thought. No potential daddies here. 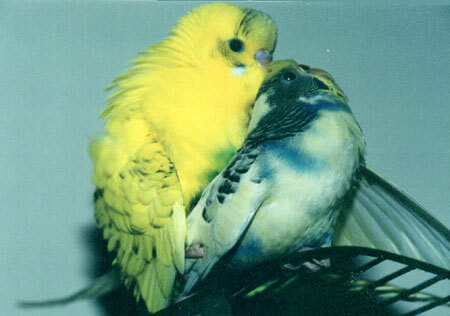 I loved my budgies but three was as much as our household could handle. 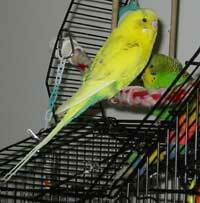 More info on how to tell gender in parakeets is on my frequently asked questions page. Eggs came a short while later and I wasn't surprised. I allowed her to sit on them because I read that removing them would cause her to lay more to replace those lost, putting her at risk for egg binding (a dangerous condition where the egg will not come out - a parakeet can die if untreated). Let her brood then, I thought. No harm done. See how this parakeet's cere looks pink? That's why I thought he was a female. For years I called him "pretty girl!" You're looking at the bird I nicknamed Homer Simpson because he's yellow and usually eating. Runt is the green parakeet in the background. She sat on the eggs for a few weeks. It was really cute to see her all puffed up, feathers full of warm air, settling over the eggs. She laid 6 total! Egg-laying became her. This normally-spastic parakeet (I mean that in the most affectionate way possible) become calmer and happier - her behavior less adversarial, and her OCD (link opens ina new window) even lightened. 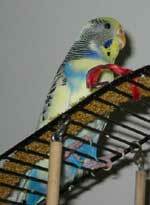 (A fulfilled parakeet is a happy parakeet - maybe all she wanted was to be a mom!) Soon Rocky began spending more and more time inside the box until we almost never saw her. Check out what Rocky used as nesting material. 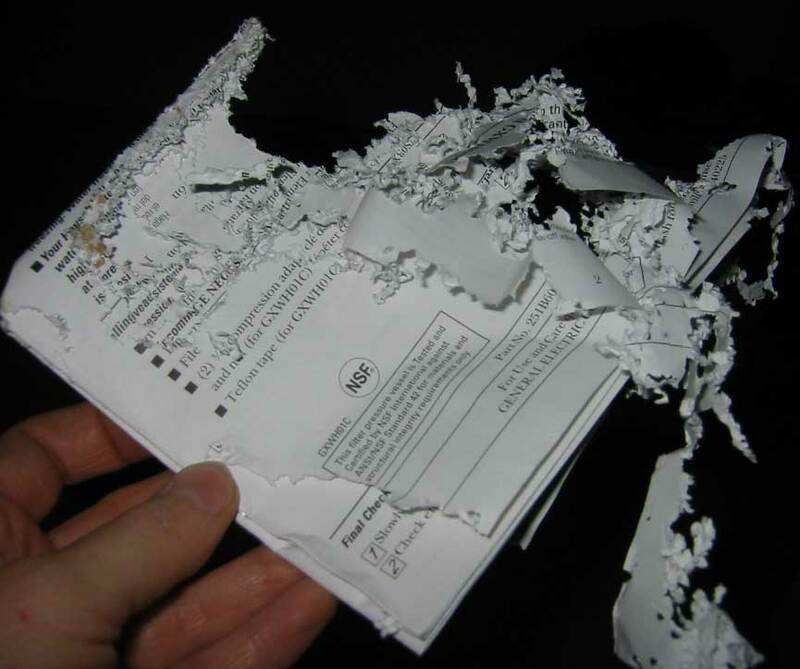 I hope we didn't need that warranty information! Weeks passed and I was wondering when she would tire of this when suddenly one morning I heard a strange sound unlike anything I'd ever heard before. I thought OMG, it sounds like it's coming from right inside the box! ??? It couldn't possibly be a chick! If there was, then it had to be a divine hatching. I stared at our yellow parakeet's pink cere and wondered what in the world was going on. Empty box that served as the nest. I'm sorry this is hard to see, I don't have a larger picture anymore... grr! Accidently erased it! The left side is where Rocky carved out an opening. The box is horizontal and long, and is lying on its side. We opened the box but I didn't see anything at first, only eggs. Funny how I was surprised to find that the new parakeet hatchling was the same size as the egg it just came out of... I don't know why I imagined it would look bigger. Maybe I thought limbs and head would uncurl like a fern, so it would stand out among the clutch. But it didn't. If the chick hadn't moved, I wouldn't have known it was even there. It didn't help that I could barely see inside the dark cardboard box. That was the start of an amazing month as I got to watch the budgie hatchling grow up. That's what this site is about - pictures of the parakeet chick growing up, and what I've learned about parakeets along the way.